Toshinori Sakamoto is an experienced and acclaimed Taiko Master. He founded RINDO DAIKO in Kyushu as well as several Taiko teams in Melbourne since settling here in 1995. Noriko Tadano is an exceptional Shamisen player and singer currently gaining national and international recognition for her craft. 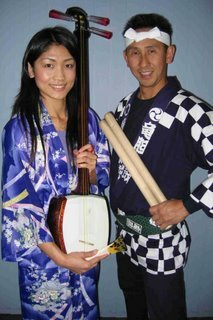 Toshi & Noriko perform together in Wa-sa-bi, and are also available separately for workshops. When the thundering power of the Taiko meets the shimmering beauty of the Shamisen no one is left unmoved. Wasabi consists of two master musicians of the Japanese tradition. Join them as they take your students on an unforgettable and exhilarating journey through the music and culture of Japan. With plenty of participation and loads of laughs blended seamlessly with virtuoso performance, your students will have so much fun they’ll never guess how much they’ve learnt! One of the most exciting and vibrant elements of traditional Japanese culture comes to life in Toshi Sakamoto’s explosive presentations. of student participation mixed with significant historical and cultural information. Vocab lists and information sheets are provided for preparation and follow up activities. WORKSHOPS are 30 – 40 mins each, depending on period length and class change-over times. They include a short demonstration, an explanation of the drums and their history and the opportunity for the students to play the drums themselves. Every student in groups of up to 30 will have the chance to play. Larger groups are possible but limit the “hands-on” aspect of the workshops. His workshops can start with a 10 – 15 minute whole school performance. Noriko Tadano plays both traditional Japanese folk songs (Minyo) as well as original pieces on the Tsugaru Shamisen (Japanese Banjo). While traditional Minyo depicts the life and feelings of ‘older’ Japan, centring around the themes of love, family and a close connection with nature, Noriko’s original pieces explore feelings and experiences through melodic notes and heart pounding beats. In the workshops, Noriko explains and demonstrates the Shamisen in more depth, and shows students its many characteristics. Students will have the opportunity to play the Shamisen with her. Noriko also teaches Japanese Bono Dori dancing in her workshops. It is very energetic and students love it. The dancing song is a fisherman’s song, incorporating many movements of their work style: pulling nets from the ocean, collecting fish and so on.